Tubes of wrapping paper tend to tumble around, making them difficult to handle, difficult to carry and difficult to store. Well, now there's an easy way to handle, carry and store your wrapping paper! 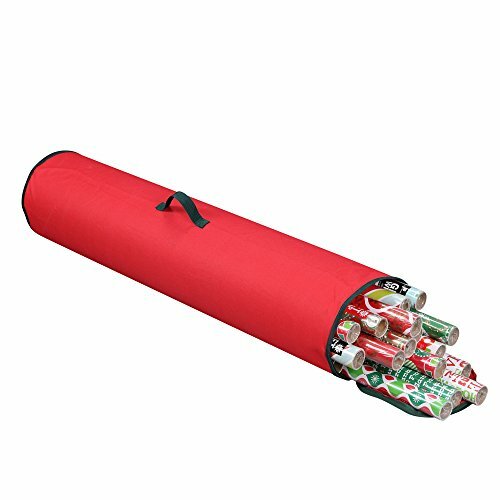 This soft tube case by Primode is 40" long and 9" in diameter, which means it is just the right size to adequately and safely store multiple rolls of gift wrap. The zippered top lets you fully seal the bag in order to protect your gift wrapping and keep it fresh until next gifting season, while the attached handles allow for effortless carrying. The Xmas wrapping paper bag is roomy enough to also store some bows, rolls of ribbon and gift tags, so you'll have everything all together in one spot. You can also use the handles to hang the bag if you are tight on storage space. Since it is highlighted by seasonal shades of Xmas green and Rudolph red, these wrapping paper storage cases are quickly recognizable. Can't wait to organize your gift wrap with the help of this handy storage bag? We offer a wide selection of holiday storage bags and boxes ranging in size, color and finishes so you can be sure to find one that fits your home and holiday decor perfectly. Our goal is to be a part of your family traditions for years to come and we stand behind every item that we sell. Click 'ADD TO CART' to order your own gift wrapping storage bag now! Primode's Gift Wrap Storage Bag is what you need to keep your wrapping organized! These gift wrapping storage cases measure 40" long and 9" in diameter, allowing them to hold multiple rolls of gift wrap. Use the reinforced top handle to hang the gift wrap bag in order to save room. Use the side handle to carry it in from the garage or down from the attic. Our wrapping paper storage bag is finished with festive shades of red and green that make it easy to spot. View More In Gift Wrap Storage.